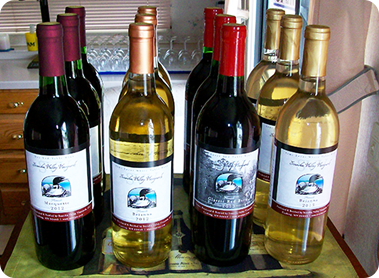 Scandia Valley Vineyard’s Red Wines are un-­fined and un­‐filtered to preserve the best qualities of flavor and aroma the grapes have to offer. Like the century old barn at Scandia Valley Vineyards, this sweet blend of specially selected Minnesota grown grapes is as timeless and classic as its country heritage. Enjoy this sweetly complex wine chilled. Inky dark and surprisingly complex, the 2013 Sabrevois is intensely berry fruit forward with soft tannins and will finish with spice and earth. To experience the best this wine has to offer, serve at 58-62 degrees and pair with your favorite Italian dish or pizza. With it’s deep Garnet color the SVV Frontenac exhibits luscious aromas of ripe red fruit. Cherry flavors are predominate with a hint of Black Currents while earthy notes round the palate. The finish will linger with herbs and toasted oak. Enjoy this wine at 60-65 degrees. With a deep ruby hue, the Estate Marquette is full-bodied and lush in the mouth. Berry fruit flavors abound with fat tannins and a touch of toasted oak. This complex beauty will age gracefully, but is ready to serve right now. Full bodied with loads of complexity, the Scandia Valley Vineyards Tempranillo sports black fruit flavors of cherries and currants. Aged on American oak and balanced with moderate tannins yields a lasting finish supporting overtones of vanilla. This wine was made for your favorite grilled steaks or chops. Aged in stainless steel for 18 months, this Vintner’s Reserve Marquette is big and bold with a harmonious presentation of forward fruit, structured tannins, balanced acidity and a touch of oak. This dry red wine is at its best when served at 60-65 degrees. Pair with dark chocolate for some real palate pleasure. With a wonderful aroma of citrus and herbs, the Scandia Valley Vineyards Fumè blanc is lively and refreshing with loads of fruit flavors like grapefruit and lemon. The finish is uniquely complex, crisp and zesty with hints of herbs and a touch of smoke and vanilla. LaCrescent is possibly Minnesota’s favorite white wine produced with locally grown fruit. Lively and sweetly crisp, this aromatic wine is booming with citrus, pineapple, and apricot flavors. Exquisite mouth feel and balancing acidity create a perfectly refreshing finish. In honor of “Chase” the wonder cat, this blend of LaCrescent and Prairie Star grapes possesses a unique character just like ole “Chase Cat.” Plenty of tropical fruit here, mild tannins and a smooth finish with a touch of oak. We miss our “Chase” and trust you will enjoy this lovely wine in tribute to his 17 years of Catpanionship! The 2013 Brianna is wonderfully clean and crisp with abundant tropical fruit flavors like pineapple, apricot, and peach. Enjoy this delicately refreshing white wine slightly chilled. Più Dolcé is Italian for “more sweet” and this delicate blend of LaCrescent and Brianna promotes fresh grapefruit and peach flavors with just the right amount of Dolcé to enhance a splendid finish. Serve chilled and enjoy! Locally grown Frontenac Gris is the foundation for this full-flavored Blush. Fruitful with balance and a perfect touch of sweetness yields a wonderful wine for everyday or even that special occasion. With a foundation of Estate LaCrescent, this sweetly glorious dessert wine is a perfect completion to any meal, or pair with fresh fruit as an anytime treat. Serve chilled at 42-45 degrees and savor a Glorioso experience.